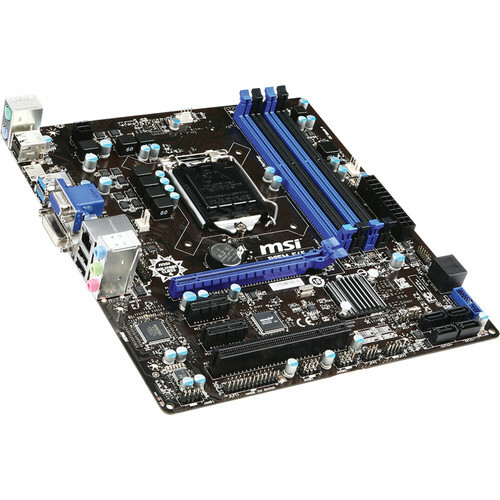 The MSI CSM-B85M-E45 Micro-ATX Motherboard supports 4th generation of Haswell Intel processors and can accept to 32GB of RAM. It has four SATA III connectors and two SATA II connectors allow you to add hard drives and optical drives for installing software and saving long-term data. This micro-ATX motherboard can fit into smaller cases and offers four USB 3.0 ports, two PS/2 ports, one parallel port, and one serial port. It features a Gigabit Ethernet jack for connecting with networks and Realtek ALC887 audio for providing sound to your speakers via three audio jacks. Additionally, it delivers graphics to your display through an HDMI port when an Intel processor with integrated graphics is installed. The motherboard is designed to be compatible with 4rd Gen Intel Core i7/Core i5/Core i3/Pentium/Celeron processors for the LGA 1150 socket. With 32 GB/s transfer speeds, PCIe 3.0 provides twice the transfer rate when compared to the previous generation. Additionally, PCIe 3.0 is suitable for use with PCI Express x16 cards and increases efficiency and compatibility. Enjoy the 4K UHD video playback now. MSI's 8 series motherboard that equips with HDMI port(s) supports the 4K UHD (2160p ultra-high definition) signal output to provide a unprecedented visual experience. When used, OC Genie 4 accelerates your entire system and puts it into overdrive. Tuned by the professional overclockers, OC Genie 4 provides you with the performance you need. Compared to common motherboard which need extra BIOS chips, MSI's M-Flash has a double advantage which doesn't need extra components and secondly, all your BIOS data will be saved in the USB drive. The stored data does not only have backup and upgrade function, moreover it can also be seen as a portable BIOS chip which is actually able to boot up your PC. MSI Live Update 5 is an application for updating BIOS and drivers, saving you time and lowers the risk of updating. End users can install and run the Live Update 5 software on their computers with the companion CD or downloading the app from the MSI website. Box Dimensions (LxWxH) 11.102 x 10.709 x 2.598"
CSM-B85M-E45 Micro-ATX Motherboard is rated 5.0 out of 5 by 1. Rated 5 out of 5 by Anonymous from Solid Does everything I need it to do. Does it support Haswell Refresh CPU without updating BIOS? Please kindly note: the B85 chipset does not support Haswell Devils Canyon CPUs. Devils Canyon is only supported by H97 and Z97 chipsets.